1 DAF 575 age and hours unknown, fitted on this barge in 2009. 6 batteries 2 start the engine, 4 for the domestic service. 2 water heaters, 1 in the engine room water warmed by the engine, 1 electric in the little technical room nearby the wetroom. 1 heating and cooling unit, MITSUBISHI MSZ GE35VA with an annual maintenance contract. 2 electric radiators only used when the weather is very cold. Built in 1926 in Arnhem in Nederlands, 21,50 meters long rudder turned down, 23,50 meters long rudder turned up, 4 meters large. One steering position with a tiller on the aft deck. Riveted steel hull, great works on it in February 2015 after a survey. The surveyor gave his certificate for works realized. Boat now in conformity. TRIWV valid until 4th February 2020. Side decks are low enough to allow easy access. Huge rear terrace for the only steering position and for a hatch to go down to the engine room. 5 of the 6 batteries in the engine room, the fifth is in the technical room opening on the heads. 2 hatches on the foredeck, 1 for the anchor locker and storage, 1 for 2 water fresh tanks and pump. A third water tank, filled up with fresh water or canal water only used for the WC is located in a the technical room opening on the wetroom. 1 locker on starboard for the 13 kg gas bottle in service. 5 steps lower the terrace is the living space, saloon, desk, shelves and electric panels on port, storage in a large cupboard, equipped with wood doors from an old laundry cupboard on starboard. Forwards, the table on port and galley in a L form and the air conditioning on starboard. Interesting deco. from the butcher table to the old scale. Table and chairs TOLIX®, famous french brand for industrial designed furniture, still built in France. A corridor on port leads forward to the shower on starboard and the cabin at the end. Shower, basin, electric WC and washing machine in the wetroom and an access to the technical little room. An inland bed 140 X 190 cm in the cabin endowed with many cupboards. Grey and white colors in the private spaces, cool atmosphere. Wood for the floors, blinds in the living room, curtains in the cabin. Headroom from 1,90 m to 2,10 m.
Decorations to be discussed during the negociation. Boatshed Bourgogne is happy to offer this dutch barge built in 1926 in Arnhem, Nederlands. Very interesting and efficient renovation. Meticulous maintenance.The current owners have sailed a lot, over 1000 kms and 450 locks passed per year. Inside, a long and large living space, luminous thanks to larges windows, outside a huge terrace and comfortable side decks, make of this barge a solution for persons searching nice space to live on water and nice boat to navigate. All things are in order, meticulously maintened. Ideal for a couple who wants domestic comfort and longs navigations. For more information or organise a visit, please contact Graham WHARMBY, your local broker at Boatshed Bourgogne. 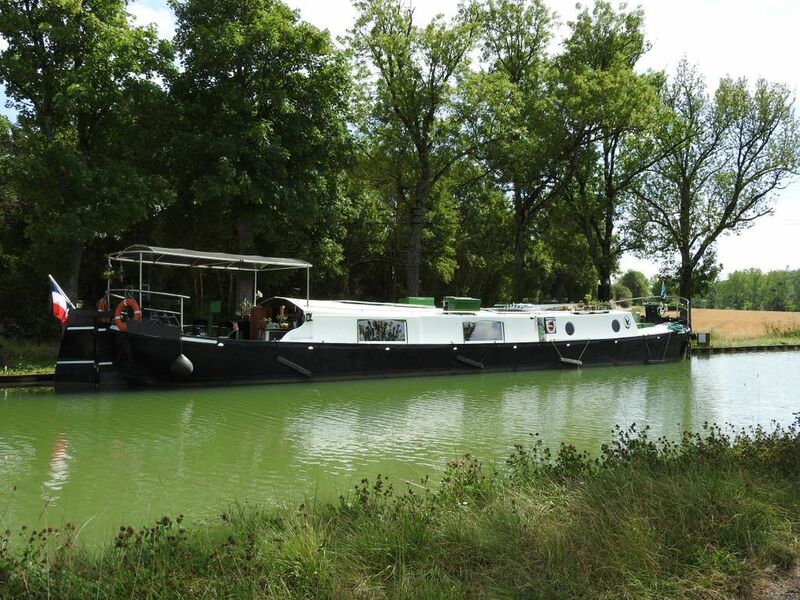 This Dutch Barge 23m has been personally photographed and viewed by Cathy BOUGUEREAU of Boatshed Bourgogne. Click here for contact details.